If you look closely at this marvelous process of Life, you will know that anything and everything in Life is cyclical. When you see six feet of snow outside, you’re not worried that it’s going to be winter for the rest of your life. You know that spring is just around the corner! Actually everything in Life can be as simple as this. I don’t mean to say that you should adopt a Pollyanna attitude or ignore challenges. You just need to make conscious decisions – to keep your life simple; to emerge stronger from every challenge that Life presents to you. …..These are the ebbs and flows of Life. Circumstances may be tough and challenging at this time. But from the cyclical magic of Life, we know deep inside that good times are just around the corner. Especially if you are lucky to live in a free country like the United States of America, you have no reason to blame your stars. The United States of America is a “dreamland” for thousands of immigrants who pour in every day, to materialize their American Dream. Yet, too often we see folks in America blaming someone else or their stars for their flaws or inadequacies or lack. There are always silver linings in clouds – only you can uncover that silver lining that is yours. What a sad picture! Really? Does this mean that you have no control? I don’t think so, folks! In fact, you and only you have the real control of your Life! It’s ironic that we often complain about things that we have control over; but do’nt take control of. The process of taking charge and being in control (of anything and everything in your life) has to start from within. It starts with diligent use or the most beautiful gift that God have given all of us humans – the Mind. So when you’re down – put your Mind to work. “If you are born poor it’s not your mistake. Use your Mind wisely, and most of your blues will fade away before you know. You may not be able to change others – but you can always change yourself. Fast food restaurants are always going to be there – You cannot ask them to shut down! ☺But, you can make that choice to not stop by for an order of French Fries or Hot Fudge Sundae. Beats me, if you’re even thinking about changing the profit-minded attitude of corporate businessmen who employ you! ☺But, you can make that choice to learn a new skill or look for a new job if your boss is nagging you. This is an excellent easy to read book in which Deepak Chopra explains seven simple principles / techniques that can be incorporated into our daily living. Chopra stresses on helping us identify the “fear-based” mode of thinking that many of are used to, which is in fact a main cause of unhappiness in many situations. He also provides the strategy to substitue these negative ways of thinking with more effective positive ways. 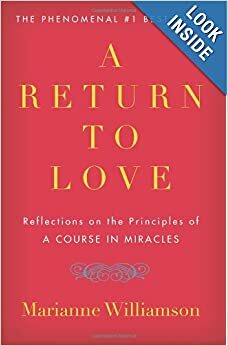 This book is based on Marianne Williamson’s experiences as a teacher and lecturer of “A Course in Miracles”; and applying the principles of this course in her life. She explains in detail how changing your thoughts and perception can literally alter your life. She provides specific steps on how to refocus your thoughts to generate happiness in your lives.